Macbooks are definitely gorgeous computing powerhouses, but some models haven't got the biggest internal storage. Unfortunately, external hard drives are slow and bulky, while SSDs are expensive. 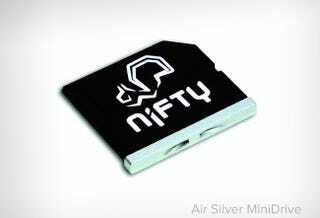 One potential solution is the Nifty MiniDrive Air. In essence, the Kickstarter-funded MiniDrive Air is a MicroSD to SD converter that's happy to work with any make or size of card, meaning that it works as a tiny, speedy SSD. It fits flush inside the Macbook's SD card slot and has a cap which is made of Apple's kind of brushed aluminum. With the Nifty Drive, the storage available inside your MacBook Air immediately expands by however large the MicroSD card is. Right now, Gizmodo readers can get the MiniDrive Air for 10% off, now making it $35.99.